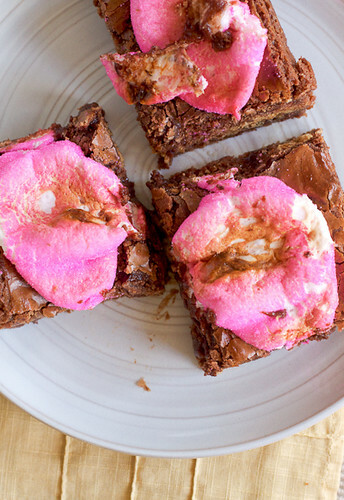 I wish I could say that no Peeps were harmed in the making of these brownies but clearly, that’s not the truth. 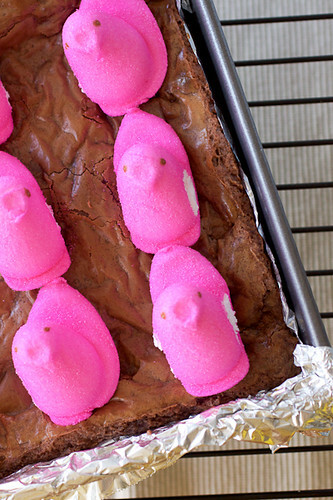 These poor Peeps got the brunt of the broiler for the sake of a decadent Easter candy brownie and I’m not at all sorry. Defiling these Peeps was totally worth it. As was filling one of my favorite brownie recipes with a layer of Reese’s Eggs. I considered adding a layer of graham cracker crumbs to the bottom of these brownies but really, they didn’t need anything else to make them as outstanding (and super sweet…and rich) as they ended up being. 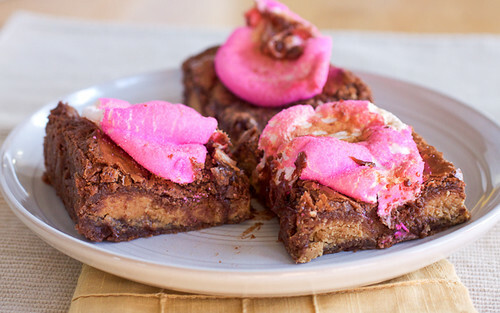 Thankfully the candy is gone now – well, except my small secret stash that will make it out only on Easter day – because I don’t know if I can handle much more sugar after coming down off of the rush from these brownies. But…if you’re looking for a way to make some quick use of the leftover Easter candy in your house, this is the way to go. Toast those Peeps, peeps! Preheat oven to 350° F. Line an 8-inch square pan with aluminum foil and lightly spray the foil with cooking spray. Toss the Reese’s Eggs with 2 teaspoons of flour in a medium mixing bowl until the Eggs are lightly coated with flour; set aside. Melt the butter in a medium saucepan over medium-low heat. Add in the chopped chocolate and stir with a whisk until melted. Remove the pan from the heat and whisk in the sugar until it is completely incorporated. Quickly whisk in the eggs one at a time and then the vanilla. Mix in the flour and salt and once the flour is mostly incorporated, whisk the batter vigorously for 30 seconds. Pour 2/3 of the batter into the prepared pan. Gently place the Reese’s Eggs (just the Eggs, not any leftover flour that may be in the bottom of the bowl) on top of the batter. Pour the remaining batter over the Eggs, taking care not to push down on the Eggs while you smooth out the batter evenly over them with an offset spatula. Bake for 30-35 minutes, until the center of the brownies no longer jiggles when lightly shaken. The toothpick test will be difficult here unless you know exactly where you placed the Eggs. Remove the pan from the oven. Turn the broiler on and set the top rack about 6 to 8 inches from the broiler. Press the Peeps lightly into top of the baked and still hot brownies then transfer the pan back to the oven. 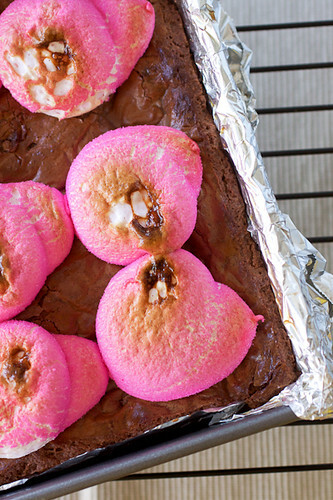 Watch the marshmallows carefully! Depending on your broiler, it should take about 3-5 minutes to get the marshmallows to start toasting but when it starts, they’ll be toasted very quickly. Once they are toasted to your liking, remove the pan from the oven and set it on a wire rack to cool for at least 40 minutes before lifting the foil out of the pan. Allow the brownies to cool for another 15-20 minutes before cutting.